Cloud forest is quite different from lowland tropical rain forest. The name comes from the observation that the forests are nearly always shrouded in clouds. 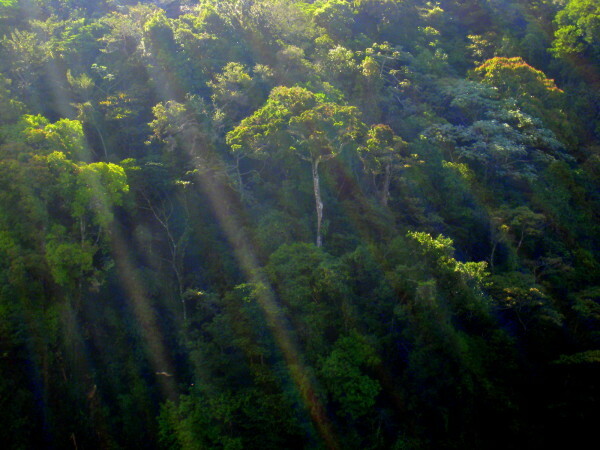 These forests are situated at high altitude along the continental divide down the spine of Costa Rica. As the warm moist air from over the Pacific or Caribbean is pushed up the sides of the mountains, it cools, and the moisture begins to condense forming clouds. Much of the moisture and a significant portion of the nutrients that sustains the botany of Monteverde are literally pulled out of the clouds. The soil is so poor that plants have adapted to take advantage of the minerals and organic matter floating around in the air. Specialized tiny hair-like growths sweep the air to collect moisture and dust in tiny droplets. The droplets collect into drops, then the water that these forests pull out of the clouds trickles down stems and trunks, impurities being captured as precious nourishment by epiphytes before it eventually reaches the ground. As the sun warms the air through the day the condensation is reduced and the clouds begin to thin, but the dense green everywhere slows the water on its trip towards the ocean. 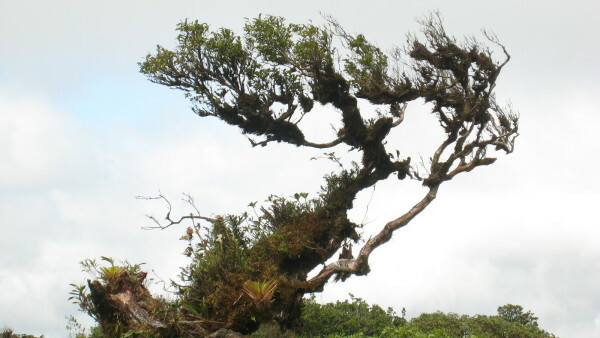 The huge surface area of the cloud forest allows much of the captured water to evaporate back into the atmosphere to provide humidity for the next morning’s clouds. The water that escapes this cycle, dragged out by gravity, feeds the streams that supply water to the valleys below. As in other forests, the roots (and their associated rhizobial mats) form barriers to erosion from the water running on the ground. They keep the mountainsides intact, preventing tragically destructive mudslides when heavy rains occur. The cloud forests of Monteverde are intact today because of the foresight of the early Quaker (a pacifist religious group) settlers, and their decision to buy and preserve this critical watershed. Eleven Quaker families came to Costa Rica from the United States in 1951 because it was a peaceful place that in many ways supported their ideals. Their dairy farm and associated cheese factory now produce over a ton of cheese a day, and much of the 1,500 hectares they purchased nearly sixty years ago is now part of the Monteverde Cloud forest reserve. The reserve is interlaced with trails ranging from a few hundred meters to several kilometers, and a map is included in your entrance fee. The main attraction of the area is a walk, or guided tour, on these trails through the cloud forest The trails are well maintained, clearly signed, and it is quite easy to make your way around the reserve without a guide. However, a guide is a good investment. Like Monteverde, Santa Elena is both the name of a small village and the name of a cloud forest reserve. The Pueblo is continuous with the resorts and hotels of the Monteverde region, and the reserve is about 5 km northeast of town. 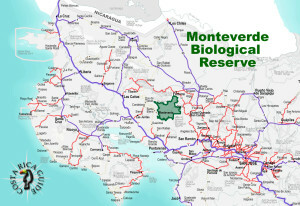 This reserve is similar to Monteverde, and has over ten kilometers of good (although none are cement block paved as some are in Monteverde) hiking trails. It is much less visited but equally attractive. When’s the Best Time to Go To Monteverde? 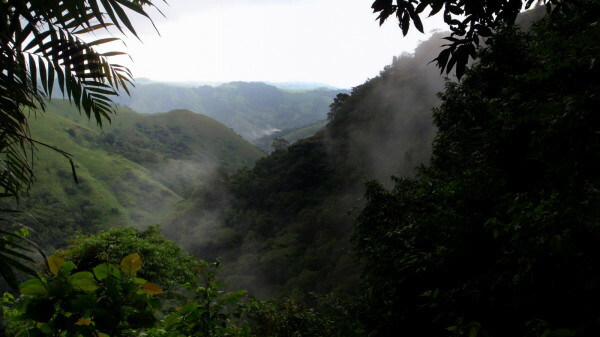 The weather in Monteverde generally follows the Pacific pattern even though the continental divide bisects the park the part that tourist can access is mainly on the west slope. Monteverde is at a relatively high elevation so it’s generally cooler than most Costa Rican destinations so bring a jacket. 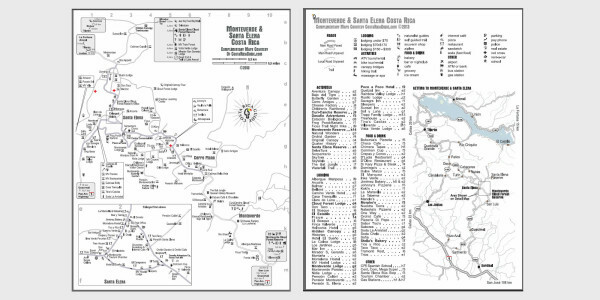 Hotels, ecolodges, restaurants, canopy tours, waterfalls, hiking trails, public and private reserves and more on a detailed, accurate, printable map of Monteverde. 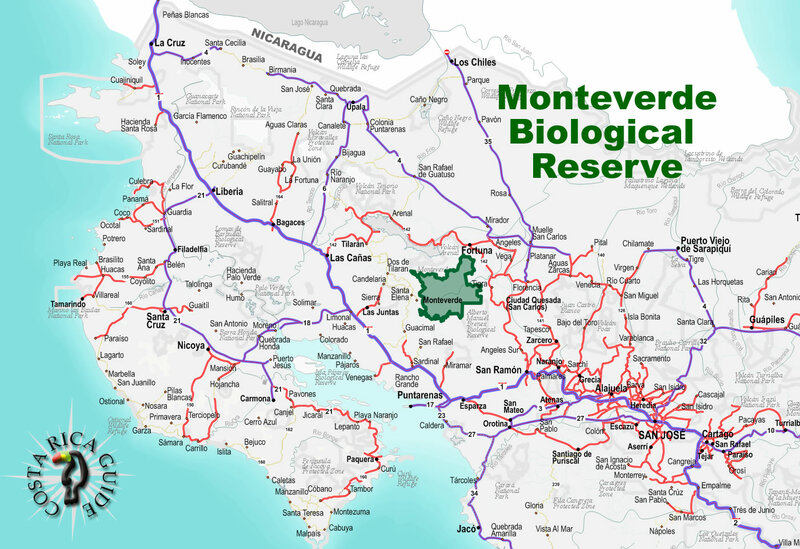 Click the image above to go to the attachment page where you can choose either a large jpg version or the full resolution printable PDF map download of Monteverde compliments of Costa Rica Guide and Toucan Maps Inc.
What about the jungles in Costa Rica? You may have noticed that the word jungle doesn’t show up very often on the pages of this website. That is because “jungle” conjures visions of something that doesn’t really match the forests of Costa Rica. The impenetrable vines and branches that movie stars hack through with machetes when they are making their way in the jungle are an anomaly in the rain forests, cloud forests and dry forests of the tropics. Deep in the forest, very little light makes it through the canopy, and relatively little foliage grows in the dark regions near the ground. Fallen trees and leaves are degraded very quickly and other than the greasy mud there is little to hinder your progress, and no need for a machete. The only places that the machete chopping type of jungle is likely to be found is near a road cut, river edge, where a forest giant has fallen or near the fringes of a clear-cut where the light can penetrate to the ground in what is referred to as Gallery Forest. The roads to the Reserve are infamous – so bad in fact that some car rental agencies have clauses prohibiting taking vehicles there. Half a dozen government administrations over two decades have made and broken promises to pave the way to Monteverde but it looks like it may finally happen. In mid 2017 the funds were approved to begin paving the last 18 km (shown as dashed red on the map below) from the Pan American highway….oops…nope they fooled us again. 2019 update: In late 2018 the company that was supposed to complete the paving six months earlier declared that they had used all the money and ceasing work after doing nearly nothing. The bad news is after 22 years there’s still no paved route to Monteverde and no plan to complete it. The good news is the Sardinal route is open to traffic again (during 2017/18 “construction” it was closed much of the time). 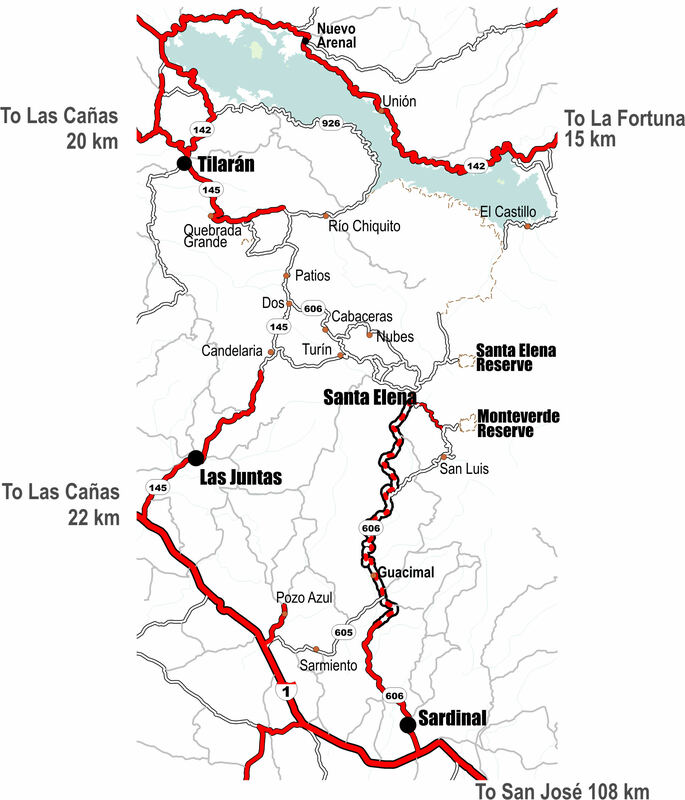 The dashed red line shows the section of road from near Guacimal to Santa Elena that remains to be paved.